Call him Robert, Robbie, Rabbie, or the Ploughman Poet: Robert Burns (25 January 1759 – 21 July 1796) is the poet-son of Scotland. He was named the “greatest Scot” in a 2009 popular vote by Scotland’s STV television channel. Of the poets who have written in the Scots language, Burns is the most well-known. He also wrote in Scots English. He saved writing in full-on English for getting his civil and political views across in commentary of the times in which he lived. Robert Burns became a Mason in July 1781, when he was 22, and over his lifetime, his writings inspired both the liberalists and the socialists. He continued to be inspiring even after his death. His influence was felt very strongly during the 19th and 20th centuries: poetically, in Scottish literature, and in the growth of poet/lyricists. A pioneer of the Romantic Movement, Burns heavily influenced both Wordsworth and Shelley. The American folk singer-songwriter Bob Dylan sites Burns’s “A Red Red Rose” (1794) as the lyric or verse that had the greatest impact on his life. Burns still inspires us each New Year as we sing Auld Lange Syne. Born in Alloway (Gàidhlig: Allmhaigh), Ayrshire (Gàidhlig: Siorrachd Inbhir Àir and Coontie o Ayrshire in Scots), to farmer parents, he was brought up with his father’s (William Burnes) moderate religious teachings, through which Burns gained a tolerance for the grimmer doctrines of Calvinism. Over time, this turned to outright rebellion which showed up in his writings. Burns did not receive very much formal schooling, but he was an avid reader and his father taught all his children how to read and write, as well as arithmetic, geography, and history. Mr. Burnes also wrote “A Manual Of Christian Belief” for his children. Robert Burns also had a tutor for mathematics, Latin and French. 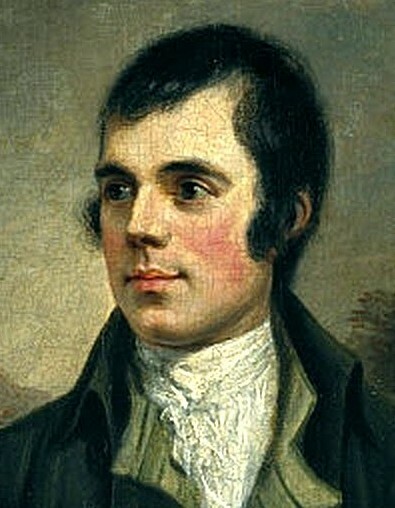 Burns’s family worked hard on their farm in Ayrshire, and the significantly hard labor at a young age may have played a part in the loss of his health as a relatively young adult. What would become his egalitarian attitude and rebellion against the privileged class began as he witnessed the troubles his father had with landlords that kept them moving from farm to farm. Finally, his father won a court battle against a landlord, but it was just two weeks before he died, and the family was bankrupt 1784. There are references to the effect on Scotland’s farms that the eruption of the Laki volcano in Iceland in 1783 had as it blanketed the UK and parts of Europe and North America with a thick haze of sulfur and ash—this could be the cause of Robert Burns’s health problems (his two younger brothers died at early ages after the eruption). It was most likley also the cause of the poor harvests, since Scotland was covered in ash and there were great storms and an Arctic Winter caused by the volcano. The summer of 1784 was also a cold one, and the storms continued through the next winter. So, despite Burns’s attempts at good farming, “I entered on this farm with full resolution, “ he wrote, “I read farming books, I calculated crops, I attended markets.” he was not able to support his family with it. Burns and his brother had moved the family to Mossgiel Farm near Mauchline (Gàidhlig, Machlainn) where along with the farming, Burns began to write his poetry……and discover his penchant for women. In his lifetime, he fathered children by six different women, fourteen children in all, nine of whom were out of wedlock. All of his encounters inspired poems and songs. (Lists of the romantic genealogy of Burns’s poetry are readily available online.) He also wrote songs of political and moral themes, giving us “Auld Lang Syne” and “Scots Wha Hae”, the song that served for many years as the unofficial anthem of Scotland. Burns began to feel the consequences of his poor health, aging prematurely. There are signs that he may have been bi-polar, and having his health fail made him despondent. Burns died in July 1796 at his home in Dumfries at the age of 37. Auld Lang Syne is one of Scotland’s (many) gifts to the world. A song of reunion, it recalls happy days gone by, separation and coming back together. “Auld lang syne” would translate into standard English as “old long ago” or more colloquially “the good old days”. It looks back at old times with a friend from childhood and seeks to rekindle the past by a handshake and a goodwill drink — “a cup of kindness yet”. Initially the song became popular as the Scottish emigration began in the 19th century, especially to the United States and to Canada. The words of friendship, family, and the hopes of seeing loved ones again sang to the Scottish hearts so far from their homeland. Traditionally sung for Hogamany, it became embedded in the New Year celebrations outside Scotland. By the way, it’s pronounced “auld” not old, and “syne” is pronounced wth an “s” not a “z”. Burns Night is a second national day of celebration in Scotland along with St Andrew’s Day. Celebrated on Burns’s birthday, 25 January, “Burns Suppers” are held all over the world. Burns Suppers start with a general welcome, followed by “The Selkirk Grace” also known as the “Covnanters’ Grace”. After the grace comes the piping in of the haggis, when Burns’s famous “Address to a Haggis” is read while the haggis is cut. Toasts and replies are made at the end of the meal and salute is made to Burns’s life and writings. “Auld Lang Syne” is sung at the close of the celebration. This entry was posted in Alloway, Ancestry, Auld Lang Syne, Ayrshire, Burns' Night, Eco-travel, Ecology, Highland Titles, Laki volcano, Land trust, New Year's Eve, Poetry, Robert Burns, Scotland, Scottish ancestry, Scottish Dialect, Scottish Folk Songs, Self drive Scotland tours, Travel, Uncategorized, Women Writers. Bookmark the permalink.